Were you one of the hundreds of Tampa brides who got engaged over the holidays? Kick off your wedding planning with the Your Wedding TV Florida Wedding Expo bridal show on Sunday, January 13, 2013 at the A La Carte Event Pavilion. 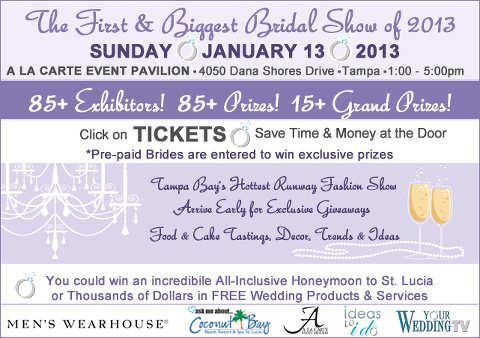 This bridal show draws about 400 Tampa Bay brides and features over 85 Tampa wedding vendors with lots of door prizes! While the bridal show runs from 1 p.m. – 5 p.m., the lobby exhibits will start at noon. The first 50 brides will receive a free t-shirt! For Tampa bridal show tips, read this great advice article: Maximizing Your Tampa Bridal Show Experience. Register online for discounted bridal show tickets, $7.50 per person or pay at the door $10.00. Door prize drawings normally occur towards the end of the bridal show and brides must be present to win.